At 1410 hours, a full assignment was dispatched to North Evarts & Winthrop Avenues for a downed power line, involving an active fire. Responding units secured the scene, stretched a handline and proceeded to standby for the arrival of Con Edison. Upon arrival, Con Edison shut down the power which allowed the handline to be operated to extinguish the fire. A check of the area found an underground natural gas leak and carbon monoxide in some surrounding residences. Con Edison & Firefighting teams entered all of the addresses on one block of North Evarts Ave, checking for carbon monoxide (venting where necessary) and shutting down the natural gas supply in all of the residences. After an extensive operation, all Fire Department units were back in service at 1730 hours. 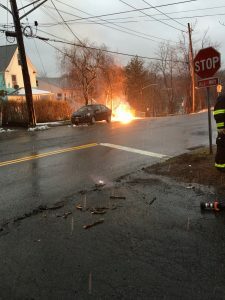 This was a fine example of Incident Command and resulting cooperation between the Fire Department, Con Edison, the Elmsford Police, DPW, Mayor and Village Administrator, in successfully handling the incident.